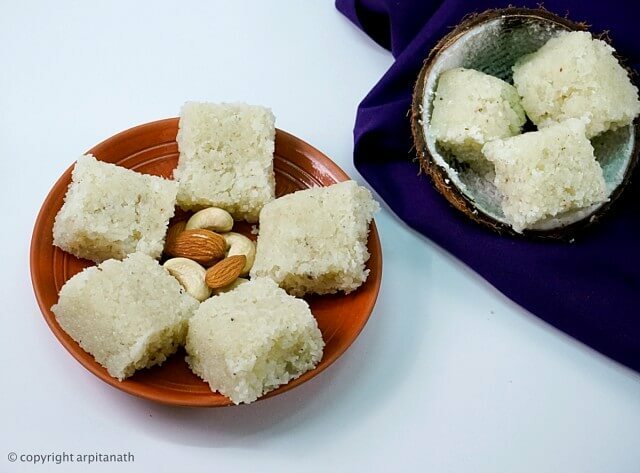 Coconut Barfi is a popular Bengali sweet that we use to make during this festive season. 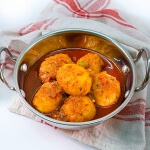 It’s a very easy to make recipe and takes only a few minutes to prepare. 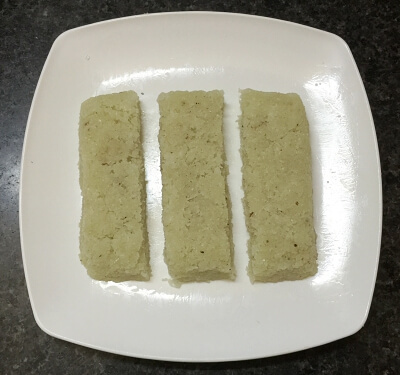 You just only need two main ingredients for this barfi, i.e. 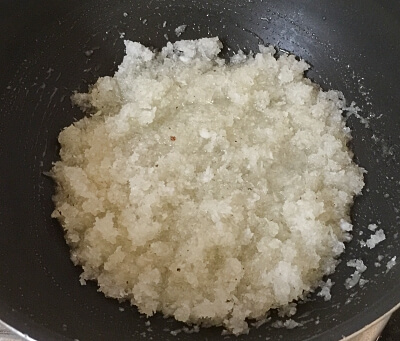 coconut and sugar. 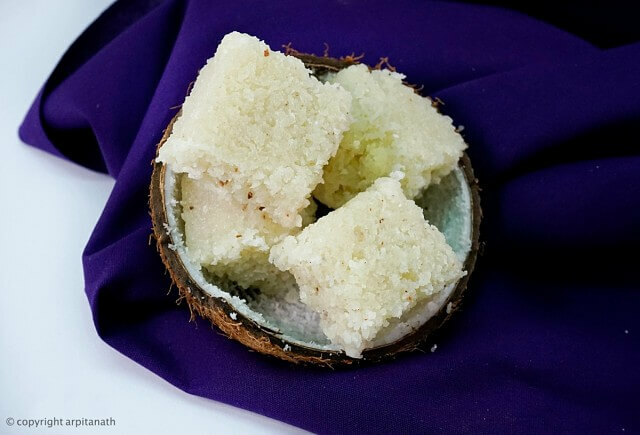 I feel Durga Puja is incomplete without these delicious and juicy coconut barfis. 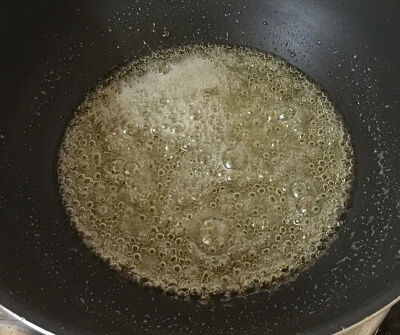 At first, to make the sugar syrup, boil 1/2 cup of water. 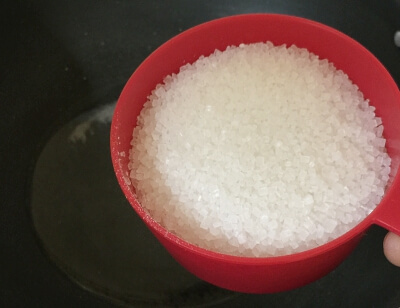 Add 3/4 cup of sugar and boil until the sugar dissolves completely into water. Keep stirring and boiling the sugar syrup until it starts bubbling and a single string consistency has formed. It will take around 5-7 minutes to make the one string consistency syrup. 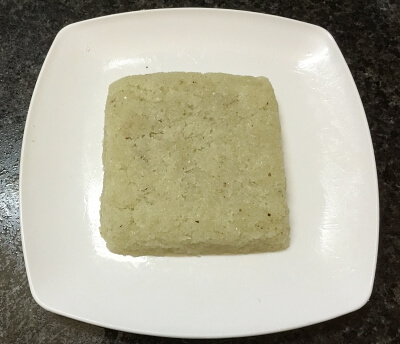 Grease a plate with few drops of ghee to set the barfi, and keep it aside. 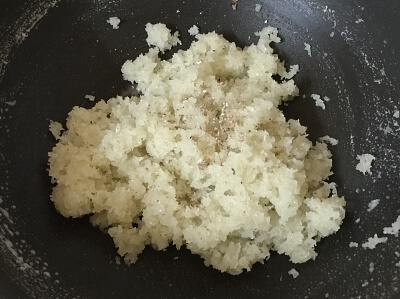 When the syrup is ready, add grated coconut into the sugar syrup and keep mixing it well on low to medium heat. 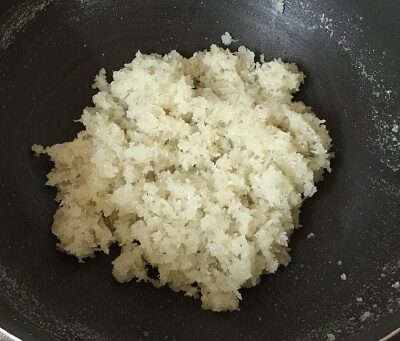 After 5 minutes the mixture will become thick and sticky. 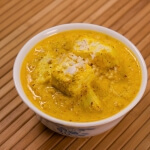 Add cardamom powder and combine it very well. 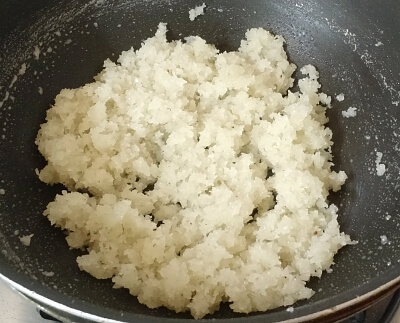 Cook for another 5 minutes on low flame and you will see the mixture starts coming off easily from the sides of the pan. Switch off the flame and transfer the mixture immediately on the greased plate or tray. 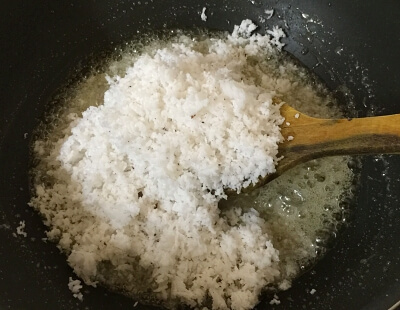 Set the mixture and smoothen the surface. 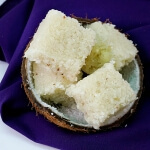 After 5-7 minutes, when the mixture is still warm, cut them into square pieces and then let them cool down completely. Store in an air tight container up to 2 weeks and enjoy. 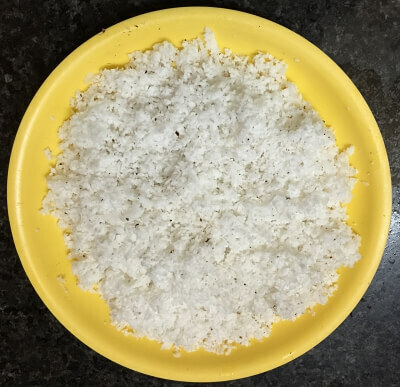 When the coconut mixture is ready, act very fast and transfer the mixture on the greased plate immediately, or the mixture will become hard. Cut the barfis when the mixture is still warm, or it will be difficult to make pieces. You can also store them in refrigerator up to 3 weeks. 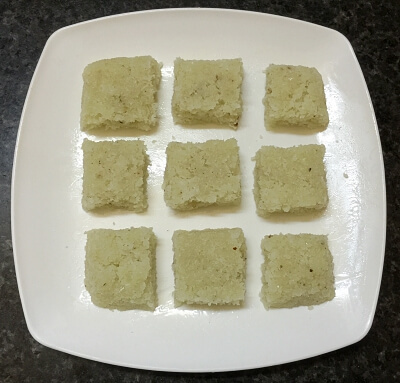 You can also search for more Indian Sweets Recipes like Coconut Kheer, Rajbhog, Bengali Chaler Payesh, Malpua, Suji ki Barfi, Coconut Laddu, Rasgulla and many more.